Some time back, a friend of mine told me that his girlfriend’s sister doesn’t eat salad dressing. Like, never. Not even a drop. There’s not a single dressing she likes, or a single kind of salad she’ll choose to dress. Not even oil and vinegar. The weird thing is, this young woman isn’t a particularly health conscious or picky eater in any other way: she eats totally without discrimination. But when it comes to dressing, she opts out. This story bewilders me, mostly because I cannot imagine life without salad dressing. While it’s true that I’ll throw regular old flax oil and lemon juice on my salads about 75% of the time, I put a lot of effort into making a bunch of dressings whenever possible. 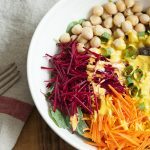 I use them not only to dress salads, but to dip raw sushi rolls in, to snack on with veggie crudites, to adorn wraps or sandwiches, to pour over steamed veggies and grains, and to dress up spiralized veggie noodles. 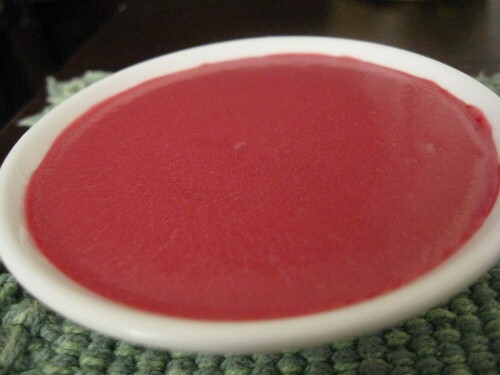 There are so many uses for a good salad dressing, so many uses that go far beyond salad itself. 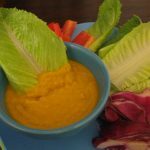 And of course, a terrific dressing can, as we know, be the difference between a salad that’s a winner and a salad that’s a dud. 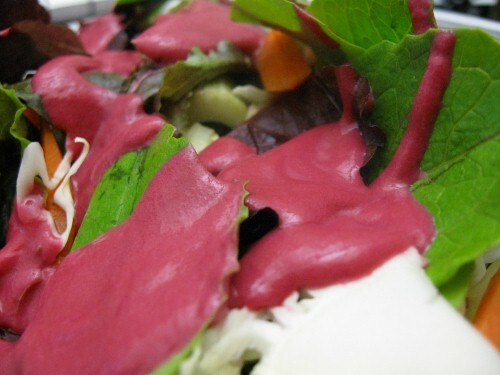 Most salad dressings are composed of a mix (usually in a 1:2 ratio, but sometimes a 3:4 or a 2:3) of a fat and an acid. The fat is usually oil, and the acid usually vinegar, but of course this doesn’t have to be true. The fat base can be nuts or nut butter, the acid lemon or fruit juice. There are tons of ways to experiment, and tons of dressings to enjoy. My favorite dressings are oil based, for the most part. And this is good, because I’m always happy for a chance to use my favorite healthy oils, like flax, hemp, and cold-pressed olive. The former two are rich in Omega-6 and Omega-3 fatty acids. If you invest in a special blend, like Udo’s 3-6-9, you’ll also be getting the DHA acids that can be tough for vegans to obtain otherwise. And you know by now that I’m a firm believer in the power of healthy fats in general. This said, some of my clients are either specifically trying to lose weight. And these clients are a little more conscientious of fat and density than others, so I’m always looking for ways to help lighten up their meals without depriving them of good taste. And this is where my veggie dressings come in. 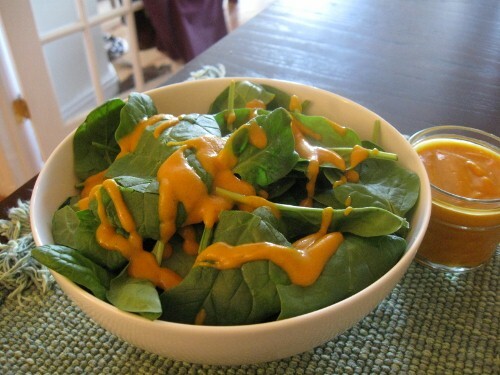 That’s right: vegetables can make a terrific base for salad dressing! If you use a veggie that’s easily blended, like zucchini, cucumber, or a steamed root vegetable, you can add terrific taste with only a fraction of the oil. If you’re a purist, you can add no oil at all, and thicken with a touch of flax seed or chia seed. And voila: perfect dressing that’s also low in fat and easy to digest. 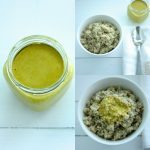 Today, I want to offer you four vegetable based salad dressings that are also delicious and satisfying. All have proven popular with clients and stricter raw foodie friends who, unlike yours truly, are a little shy about oils. And all are regular faves in my kitchen–especially the zucchini dressing, which I’ve blogged about before. All dressings yield 1 1/2 cups. Enjoy! Blend all ingredients in a high speed blender till smooth. 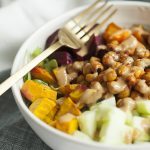 This one is especially delicious served over dark leafy greens, or when paired with pumpkin seeds! Blend all ingredients on high. This is a great way to use summer tomatoes, though they’re so perfect it seems sad to eat them any other way than sliced and sprinkled with salt! Blend all ingredients on high. 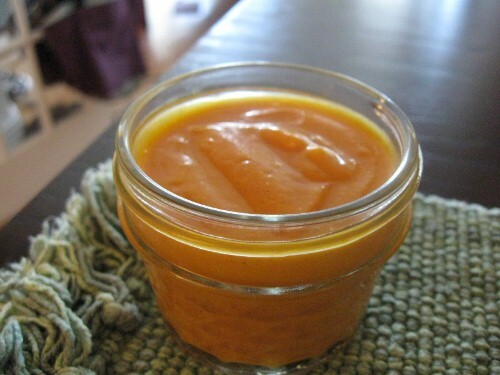 This dressing is sweet tart and surprisingly creamy. I love it over romaine salad with carrots and cucumbers! This is one of my all time favorite dressings. 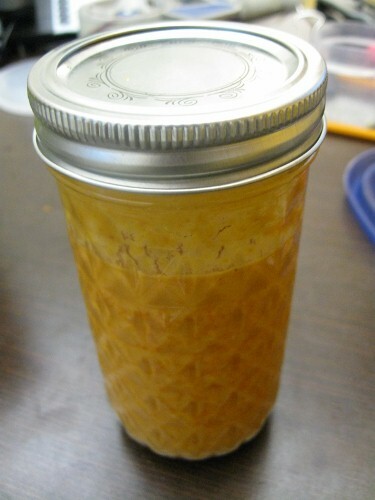 I nearly always prepare a double batch on weekends and use it up throughout the week, in various ways. You’ll be shocked that it’s as low in oil as it is, and the flax seed goes a long way to thickening it naturally. A serious Choosing Raw fave!!! 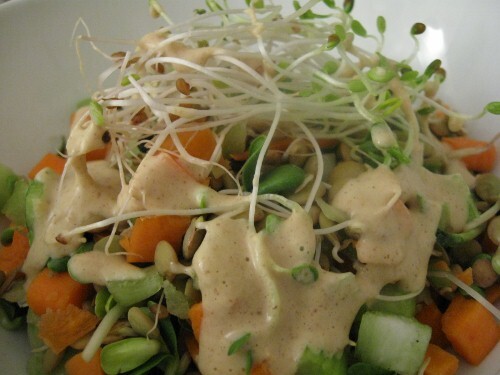 Blend all dressing ingredients on high till smooth and creamy. 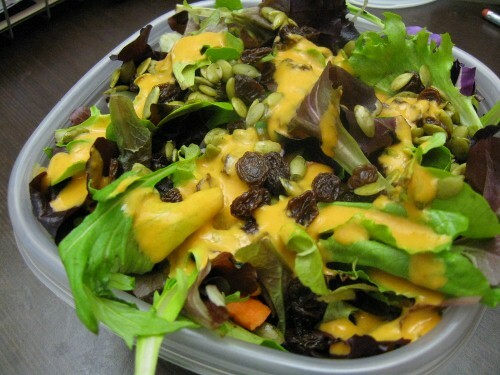 Mix salad ingredients and top with the dressing as desired. This post is just yet more proof that veggies are versatile beyond our wildest imagining. Is there ever any end to what we can do with them? I also hope it proves that there’s a lot more to dressing than oil and vinegar. So take those leftover and extra veggies out of your fridge, and start experimenting! Let me know what you come up with. Finally, do you want to win the ultimate bloggie gift? It’s a free blog makeover from Zestycook, and you can enter to win here! Good luck!!! 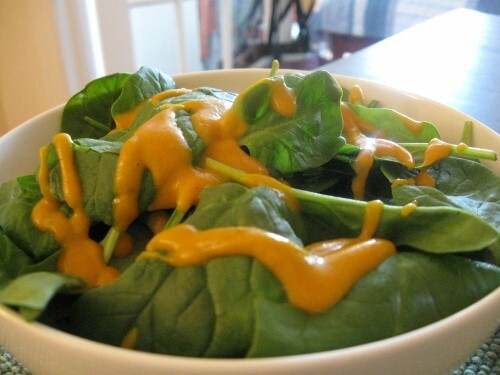 I’ve been looking for salad dressing ideas with out all the mayo or oil. These recipes look great, I can’t wait to try them.